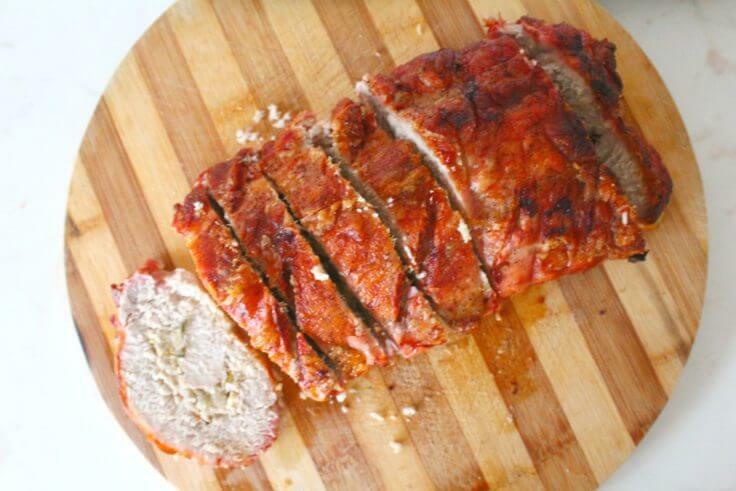 If pork is your favorite thing to cook, try this scrumptious pork loin with apples! 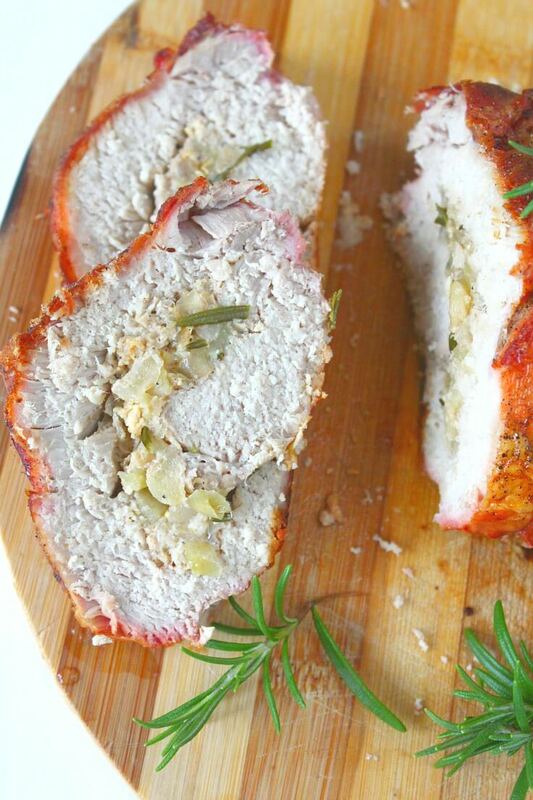 This appetizing rolled pork loin filled with a delicious pork stuffing recipe, makes a great dish for entertaining or just a family dinner! 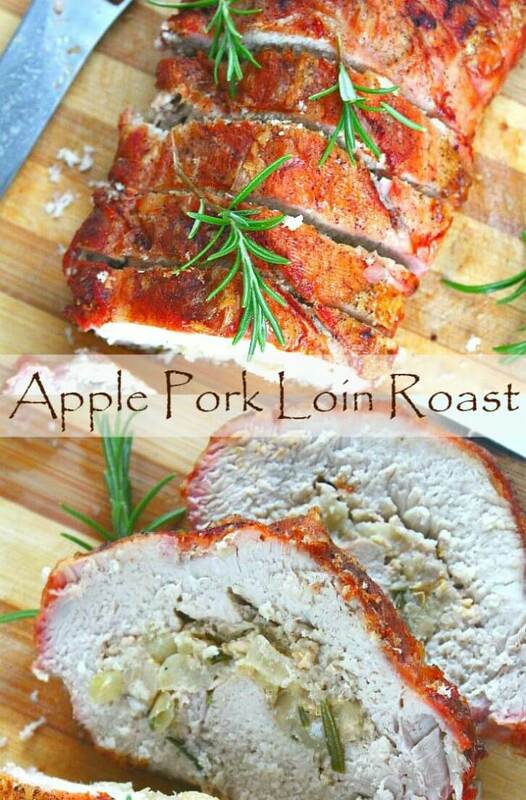 I don’t cook pork too often but since it’s holiday season I thought this pork loin with apples would be a great addition to our holiday table, Christmas and New Years in particular. Pork and apples are a timeless pairing, the sweet/tart fruit perfectly complements the heavy tasting meat, and to me, they mean fall/winter comfort food at its best! Preheat oven to 375 F = 190 C.
Roll cut the pork loin. Add the onion, apples and rosemary or sage. Saute until softened. Remove from the heat and gently stir in the bread, egg, butter, salt and pepper. Add the chicken broth gradually until everything is well moistened. Let the stuffing mixture cool completely before putting it in the pork loin. Spoon the stuffing down the pork, horizontally, in a line. 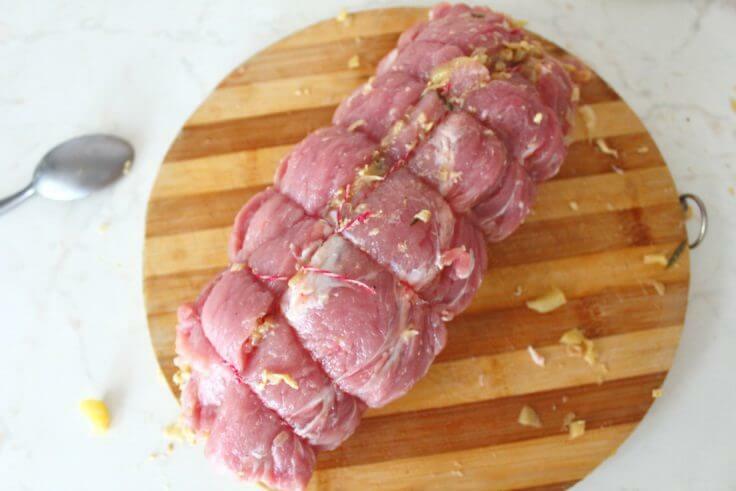 Lay your pork on a working surface and add stuffing, making sure it's spread evenly. Roll the pork over the stuffing, ending with the seam down and fat side up. Lightly score the fat with a sharp knife. 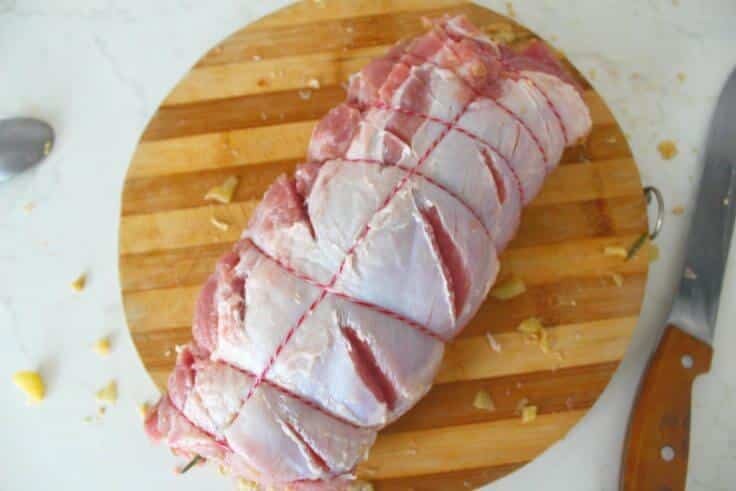 Tightly tie the pork roast up with butcher's twine, season it with more salt and pepper, and transfer to a non stick roasting pan. Roast for about 90 minutes. Remove from the oven and let rest for about 20 minutes before slicing. Serve with crispy potato roast and roasted long peppers salad. 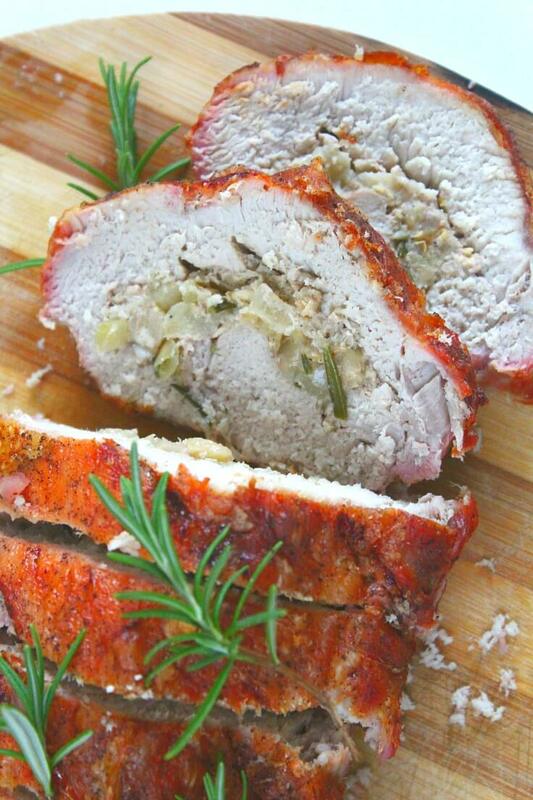 I would normally try and cut back on calories by removing the fat part but when it comes to this apple stuffed pork loin roast, leaving the fat on will give this recipe such a nice, delicious crackling. Plus I personally think it makes this pork loin with apples look more festive, perfect for a holiday meal. 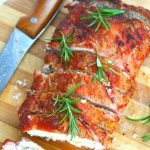 This lovely pork loin apple recipe is well browned on the outside but keeps a tender and succulent inside. Pork is normally pretty hard to cook properly, it can easily turn out dry. 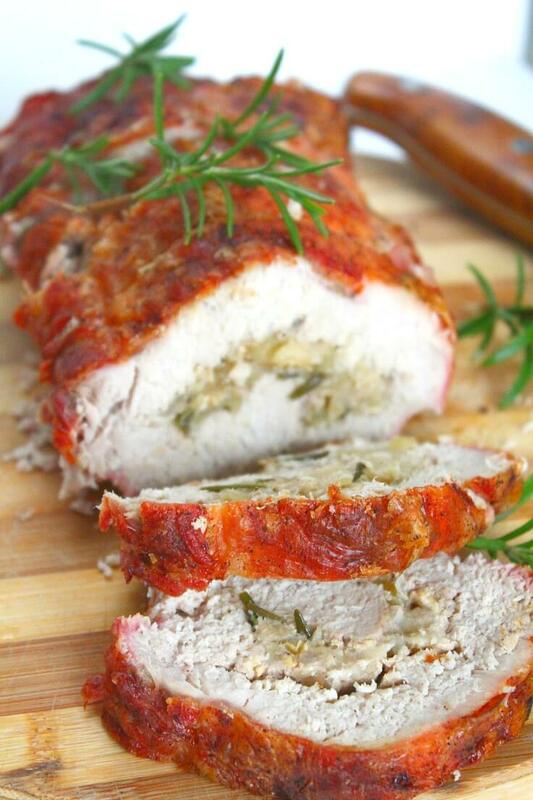 But adding a filling of juicy apples, sauteed with onions in a little oil, butter and chicken broth will add moisture to this yummy rolled stuffed pork loin right from the inside. 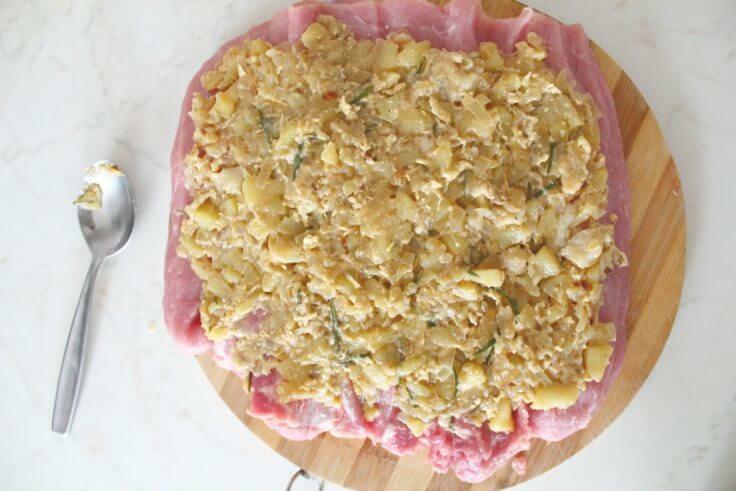 This apple stuffing for pork is simply perfect! If you want to make your pork loin with apples even juicier I believe a little brine would go a long way. The apples add an amazing fruity flavor and make a nice, fresh balance to the heaviness in the fat. 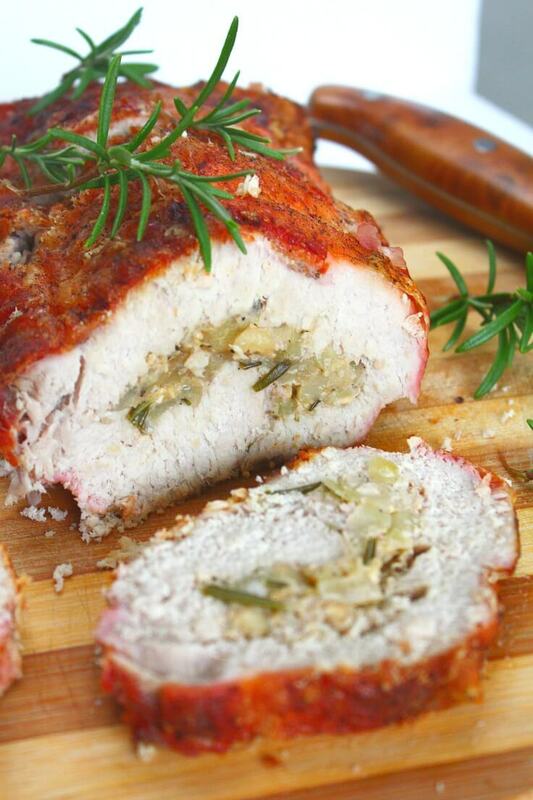 Making this flavorful rolled pork loin roast requires just a little effort and it will be well received by your guests if you’re making it for a party. This pork loin with apples could be served as an entree or as a meal, paired with this delicious, easy to make crispy potato roast I made a while back and a roasted long peppers salad. Let the stuffing mixture cool completely before putting it in the pork loin. 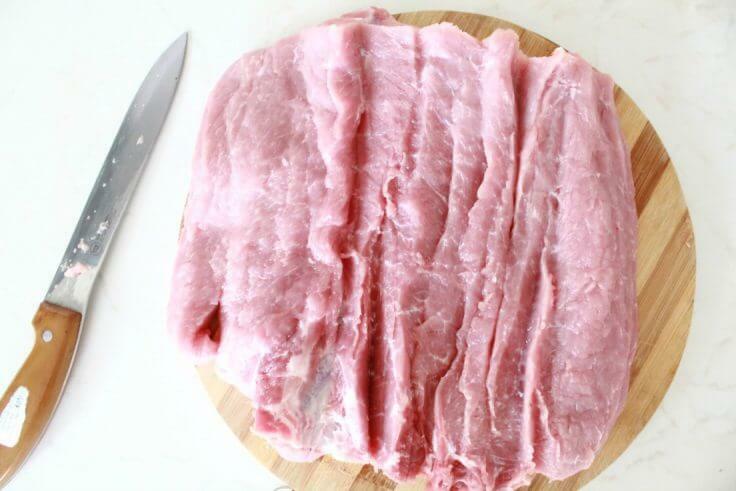 Lay your pork on a working surface and add stuffing, making sure it’s spread evenly. Roll the pork over the stuffing, ending with the seam down and fat side up. Tightly tie the pork roast up with butcher’s twine, season it with more salt and pepper, and transfer to a non stick roasting pan. Roast for about 90 minutes.